Maker: Macduff International, Glasgow, Scotland, UK. Nose: Sweet malt, apricot, old leather. Palate: Medium bodied and light. Saltwater taffy, clotted cream. Finish: Malt, vanilla, oak, burn. Mixed: Good with club soda, on the rocks and in everything else I tried it in: Rob Roy (sweet and dry), rusty nail, Scotch Orange Fix. Parting words: Grand Macnish was founded in 1863 by a man named Robert Mcnish (the a was added to aid in pronunciation). McNish is a sept of the MacGregor clan which explains why the MacGregor motto, forti nihil difficile*, appears on the cap. Corby purchased the brand in 1927. Grand Macnighs has been owned by Macduff International (owner of Lauder’s and Islay Mist) since 1991. Three other iterations of Grand Macnish are available in Michigan, the standard, bottom shelf Macnish ($9), the 12 y/o ($25) and the smoky black edition ($35). The 150th (released in 2013) and the 12 y/o are the most highly regarded among the four, which is not saying a lot, it must be said. There’s nothing too interesting happening in this bottle but there’s nothing offensive either. It’s much better than similarly priced blends from Dewars, Cutty Sark or J & B, but it’s not quite as much of a value as Grant’s. What it has in common with Grant’s is a weird bottle that draws attention to itself on the bar. $19 is a good price for “inoffensive” so Grand Macnish 150th anniversary edition is recommended. *To the strong, nothing is difficult.” This was also Benjamin Disraeli’s motto for some reason. A: Young. Malt, varnish, and a bit of brown butter. B: Richer. Woodruff, malt, hints of sherry and oak. A: Full bodied and immature. New make, alcohol, malt, not much else. B: Full bodied and more rounded. Malt, butterscotch, honey, oak. A: Hot and brash with a bit of candy sweetness on the back end. B: Creamy and sweet with a little bite. Fades slowly. Rusty Nail. Pleasantly malty with soda. B: Does well in all the above drinks, adding a nice buttery note and more depth. In other words, one can actually taste the whisky in the drink. Parting words: Both of these were perfectly adequate whiskies with the 12 y/o being the richer and more rounded of the two. 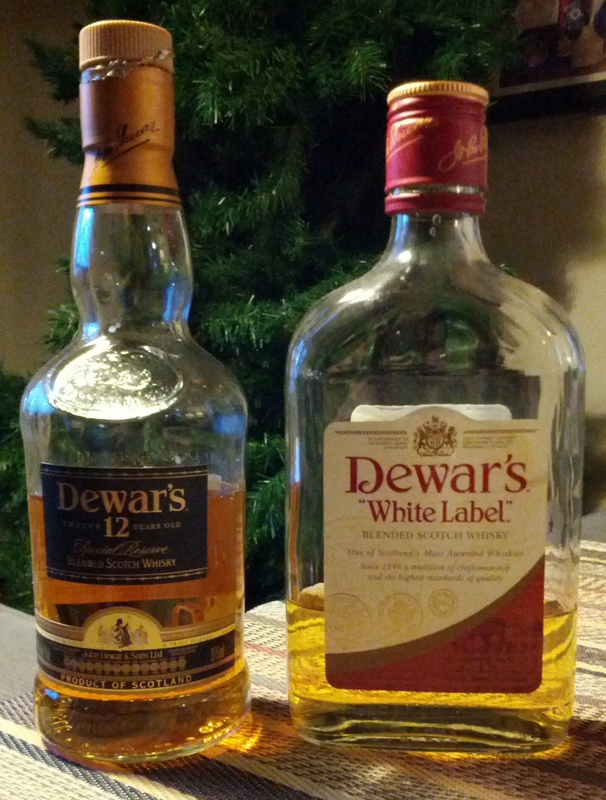 Surprisingly, given the price difference, I would rank Dewar’s White label above Johnny Walker Red, but it’s still no more than a mixer. 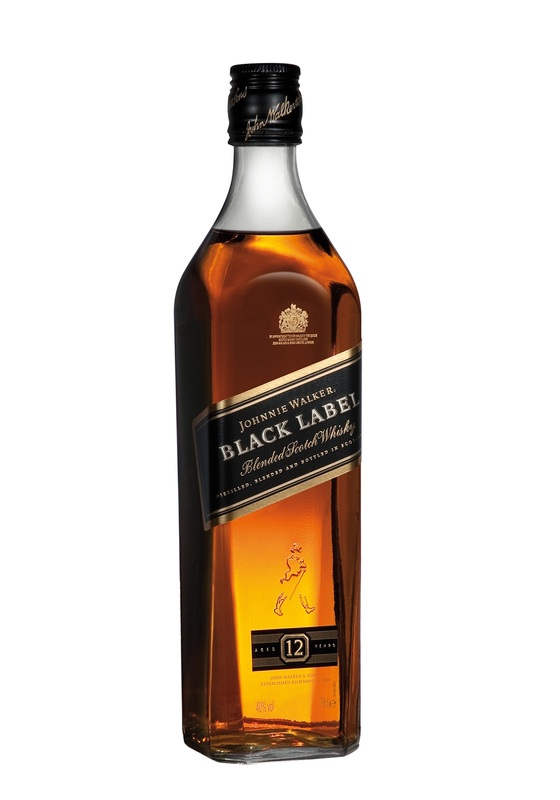 To confuse things further, I would rank the 12 y/o version below Johnny Walker Black, even though the two are the same age. The 12 does really well in cocktails but falls flat as a sipper. JW Black isn’t the most complex blend on the market but it has enough smoke and oak to keep me from dozing off mid sip. In conclusion, Dewar’s White Label is mildly recommended for mixing but not for sipping and Dewar’s 12 y/o is recommended for mixing but only mildly recommended for sipping. Distilled/Blended: Various locations in Scotland. 1) Straw with a light copper tinge. 1) Toasted malt, brown butter, dried wildflowers, passing whiff of peat. 2) Caramel, woodruff, malt, toasted wood, bit of smoke. 1) Medium bodied and very sweet. Some alcoholic burn, but mostly sweetness with a bit of a fennel note in the background. 2) Fuller bodied. More sophisticated, but also a bit dull. Drier, some wood and cola sweetness with a bit of cocoa and allspice. 1) Big grainy finish. Rancid butter, alcoholic burn. 2) Some wood, but not overwhelming. Cinnamon, a bit of smoke, and more cola. Why review whiskies like these? Everybody knows what they taste like, right? Whether they do or don’t, it’s important to me to get a grip on products like this as a taster. It’s the same reason I reviewed Jack Daniels and Jim Beam White label. I need a baseline or a benchmark or something like that. It’s hard to judge a blend without knowing what the world tastes when it orders a blended Scotch. Neither have a whole lot going on, frankly. The Red Label is not particularly good neat, but mixes nicely. It does well in a Rob Roy, Rusty Nail and in a highball. I didn’t mix the Black Label, since at 12 y/o it should be able to be sipped. It was fine, but dull as I said before. 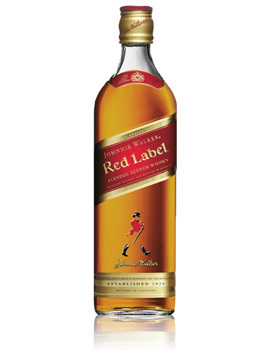 The Red Label is mildly recommended for mixing and the Black Label is recommended. Appearance: Golden straw, with long elegant legs. Nose: Classic Scotch blend nose. Toffee, butterscotch candy, lemongrass. On the palate: Full-bodied and creamy. A little heat, then rich taffy, toffee and assorted hard candies with a soft kiss of peat and a hint of ginger. Finish: Luxurious finish. The ginger races to the front in the finish, complemented by the peat and the heat. Wonderful. Parting Words: After my disappointment with White Horse, I wasn’t expecting any more than a pleasant, refreshing dram from this. But now, unfortunately, my expectations of blended Scotch have been raised again. Great King Street is refreshing and easy drinking, as a blend should be, but also complex and interesting. 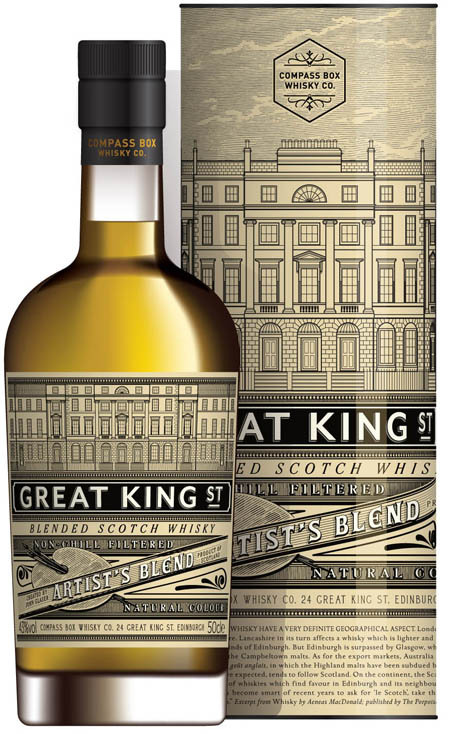 Great King street is put out by American-born John Glaser’s Compass Box Co., creator of a series of great blended malts including the Peat Monster, Eleuthera, Flaming Heart and many, many more. Great King Street is highly recommended. Appearance: Coppery caramel. Thin legs. Nose: toffee, corn syrup, wildflowers. On the palate: Thin, a bit of burn, caramel, some floral, maybe even peaty notes. Finish: Sweet. Lots of vanilla with a bit of burn and some toffee. Parting Words: I dunno what to think about this one really. On the one hand, it’s a cheap blend that is certainly worth what I paid for it, on the other hand, hearing that it contained Lagavulin Single Malt, my expectations were higher. The Islay influence is certainly there but in a very subtle way. 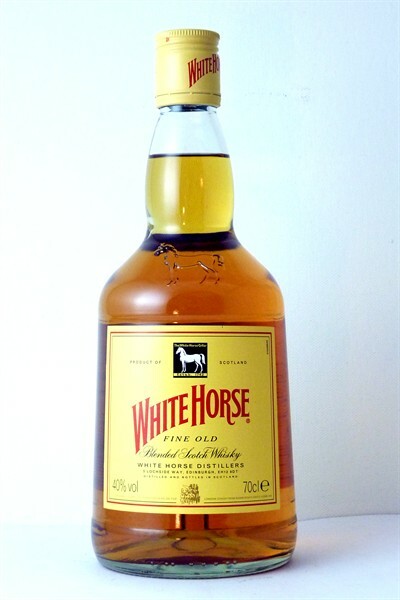 In the end, I think White Horse is a serviceable bottom-shelf blend, and worth a mild recommendation.